Summary of today’s show: One of Bl. Pope John Paul II’s major emphases in his pontificate was the New Evangelization and Pope Benedict XVI has continued that work with the establishment of the Pontifical Council for the New Evangelization. Scot Landry and Fr. Matt Williams talk with Ralph Martin, a lay member of the council and president of Renewal Ministries, about what makes the new evangelization different from the old and then discuss practical tips on how to seek opportunities to share your faith, how you might do so effectively, and why it’s the call of every baptized Catholic to do so. 1st segment: Scot Landry and Fr. Matt William caught up on their week and Fr. Matt said he’s been out at all the vicariates in the Archdiocese to meet with priests to talk about youth and young adult ministry, to see how his office, the Office for the New Evangelization of Youth and Young Adults can better serve them. Scot said he’s made the rounds of the meetings four times in his six years at the Archdiocese. They talked about how big the Archdiocese is. Fr. Matt commented on how even after 9 years in the priesthood and he’s still introducing himself to priests he doesn’t know. Fr. Matt is also planning a retreat this weekend, Friday to Monday, for teen leaders called Witness to Truth about Love, adapting the teachings of Pope John Paul’s Theology of the Body for teens. About 10 of the teens will be going to the Dominican Republic this summer on a youth service trip. Scot said today’s guest, Ralph Martin, has been appointed by Pope Benedict XVI to the Pontifical Council for the New Evangelization and has been on the forefront of Catholic evangelization for decades. 2nd segment: Ralph is the president of Renewal Ministries and also director of graduate studies at Sacred Heart Major Seminary in Detroit. Scot said Detroit reminds him a lot of the Archdiocese of Boston, including its evolution over the years. Scot said both Ralph and Curtis Martin were singled out as two lay Americans appointed as consulters to the Council. Ralph said it was a total surprise. He received a call asking him to call them back in Rome. He was told he had been appointed. Ralph said we had become used to Pope John Paul II speaking about the need for a new evangelization and some wondered what Pope Benedict would do about and it was a surprise when he institutionalized it and made it as prominent as he did. The Pope also chose the new evangelization as theme of the synod of bishops in October. Ralph said the Pope is painfully of the erosion of Catholic life. Scot asked what the new evangelization is. Ralph said evangelization was traditionally preaching the Gospel to those who have never heard it before. It brings people to relationship with Christ. The new evangelization, according to John Paul II, is directed to baptized Catholics who aren’t living the faith and have drifted away. His encyclical Redemptoris Missio makes three distinctions in Section 33. He called for new fervor in preaching the Gospel and what the different kinds are. The fact that there is a diversity of activities in the Church’s one mission is not intrinsic to that mission, but arises from the variety of circumstances in which that mission is carried out. 51 Looking at today’s world from the viewppoint of evangelization, we can distinguish three situations. Secondly, there are Christian communities with adequate and solid ecclesial structures. They are fervent in their faith and in Christian living. They bear witness to the Gospel in their surroundings and have a sense of commitment to the universal mission. In these communities the Church carries out her activity and pastoral care. Scot said one of the reasons for this falling away is that so many of us haven’t been living our faith publicly as a witness as we should. Ralph said that was one of the emphases of the Second Vatican Council and it’s universal call to holiness in the mission of Christ as part of our baptism. Fr. Matt said when people experience a conversion they sometimes think they are called to a religious vocation or to work for the Church as a job, but he said we also need people to be on fire in all areas of society. He said as a Church we’re just beginning to help people understand that. Ralph said there’s a growing understanding is that the purpose of leadership in the Church not to do the whole work of the Church, but to equip all Christians to do the work of the Lord. They need to help laypeople awaken to their participation in the work of the Church. Ralph said he was just in Rome a few weeks ago meeting with the president of the Council on the beginning of the work and getting organized. They’re having lots of meetings, especially with US bishops in Rome on their ad limina visits. But the council will ultimately take their marching orders from the results of the Synod of Bishops. Ralph expects the document will continue the work begun by Pope Paul VI and Pope John Paul II. Ralph said there will be three major events in Rome in October: the Synod, the Year of Faith, and the commemoration of the 50th anniversary of the beginning of the Second Vatican Council. He said each bishops’ conference will send a proportionate number of bishops for a total of about 350 total from around the world. There will also be a number of experts who will give 3-minute presentations like everyone as well as auditors who will be present but won’t speak. He said he thinks the result will be a recapitulation of the theology of evangelization and an encouragement to use new means. It may recommend diocesan and parish committees and offices of the new evangelization. It probably won’t get very concrete. Scot asked Ralph what he thinks is working in new evangelization in the US and abroad. Ralph said it isn’t programs that do the work, but people, and some people will feel comfortable with one approach and others with another. The main thing is for everyone to do something they feel equipped for. A diocese can’t just mandate one thing for all parishes, but should make available a whole range of possibilities. Some parishes will do Alpha or Cursillo or Ignatian Retreats or Life in the Spirit or Marriage Encounter or anything else. Let a thousand flowers bloom. Scot said many people will know a friend or family member who hasn’t practiced their faith in quite a while. What would Ralph recommend for them to propose to others to rejoin the Church actively. Ralph said it depends on the relationship and where the person is. There must be prayer and love for the person at the base. Then be sensitive what would be helpful, like inviting them to a parish mission or a parish talk on faith or coming to church with them. It might be just giving a book or pamphlet to read. Ask them what their reasons for not coming are and find answers. And a lot of times these people aren’t on the timetable to be reached now so we have to be alert for a time when we can have another opportunity to invite. Ralph said a lot of times you can have a random encounter. He related an encounter he had with a man who said he didn’t believe in God and so they had time to sit down and have a conversation. He knew he couldn’t answer all objections in a short conversation, but he wanted to remove some of the biggest obstacles. He said he challenged the man to ask God every day for one week in prayer to ask Him to reveal himself. Sometimes we plant a seed, sometimes we water a seed that someone else has planted, and sometimes we’re there for the harvest. Fr. 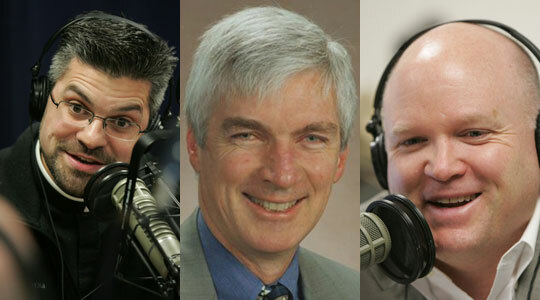 Matt encouraged listeners to pray for the man. Fr. Matt said his seminary formation spent more time on pastoral care than on evangelization. He asked Ralph how seminary formation has implemented new evangelization over the years. Ralph said in his seminary that it’s been implemented. The motto of the seminary is to prepare heralds for the new evangelization. Cardinal Adam Maida, former archbishop of Detroit, also implemented a pontifical degree in new evangelization. That was originally for laypeople, so Ralph asked to offer required courses for seminarians. They also changed their apostolic experience to include evangelization, in addition to hospital work and serving the poor. We get so consumed with those who do show up to church, we forgot those who don’t and we don’t have a plan to go after them. Scot asked how the priests ordained from this program impact their parishes. Ralph said they have been ordained over the past four years and they’re doing things like censuses, Catholics Come Home nights, making liturgies more welcoming (training greeters and readers, etc.). Scot reiterated parishes often focus on those who are in the pews, but we need to focus beyond them to those who aren’t with us. Some people may saw that they’re not suited to evangelization. What can we say to them?Ralph said the Sacrament of Baptism says it unites us to the living God and Jesus is within us. What He wants to do is awaken us to the Father, to love Him like He does, and to love other people as He does. A lot of Catholics haven’t awakened to the meaning of the indwelling Trinity. 3rd segment: This week’s benefactor card raffle winner is Collette Lavallee in Middleboro, MA. He wins the CD “The Apostle of the Rosary: Servant of God Fr. Patrick Peyton” and the booklet “Preparation for Total Consecration” by St. Louis de Montfort. 4th segment: Fr. Matt asked how one goes about evangelizing another person, like a random person you’re sitting next to on an airplane. Ralph said he usually strikes up a purely small-talk conversation, then maybe ask a little about the person. This tells you whether the person is willing or interested in talking. If they are willing, they might ask you what you do or who you are. This is an opportunity to put on the table something about being a Catholic. That opens the door to asking about their faith background. From there just keep talking and find out where they are and maybe give your own testimony, mentioning important books or events in your life. Sometimes conversations in airplanes, he’s ended up praying with someone and promising to send them a copy of a book. When he prays for God to give him opportunities, he sees them. When he doesn’t pray for them, he doesn’t see the opportunities. Fr. Matt said it has to be the work of the Holy Spirit, who is the animator of evangelization. Fr. Matt asked about praying with strangers and what that’s like. Ralph recounted the story of encountering a family at a restaurant, talking about being Catholic. The guy later Googled Ralph, find out who he is, and emailed him, asking if they could get together and talk. Ralph and his wife went to their home, talked about their sorrows and prayed with them because they were trying to have another baby. Later, Ralph was back in the city and at a church he sat behind the man’s wife and she turned around and she was pregnant. Scot said Ralph’s TV show on CatholicTV “The Choices We Face” is one of the oldest Catholic TV shows. They started Renewal Ministries in 1980 and they have several TV programs and radio shows. They also work in 30 countries, including Kazakhstan and Zimbabwe, recently. They help the local Church and sometimes organize huge rallies, as a way of countering pressure from evangelicals and other Protestants. They also do training for catechists and others. They partner with local bishops and others and maintain relationships with those local churches in Africa, Eastern Europe and Asia. Scot asked how people would join in on their short-term missions to these other places. Ralph said people can get information and sign up at their website, as well as their other resources. Ralph said they also do parish missions and seminars in the US. They also do a major rally in Toronto every year through their Canadian branch. Scot asked for practical steps to get prepared for the Solemnity of Pentecost this Sunday. Ralph said since John XXIII the popes have been crying out for a new Pentecost. We need an outpouring of the Holy Spirit. We need to encounter the Lord and recognize his magnificence, the fire for evangelization won’t be there. So we should pray for the Holy Spirit to come, to remove obstacles and hesitancies. We should pray to surrender ourselves so we become a more docile instrument in the hands of the Lord. Ralph said the Cursillo movement brought him back to the Church and then went deeper through the Charismatic renewal. He encouraged people to participate in a Life in the Spirit seminar, if that seems the way for them. Fr. Matt asked him to explain the Life in the Spirit seminar and the Charismatic renewal. Ralph said Cardinal Suenens described its purpose as not being for everybody to join, but to be a witness and living voice to awaken the whole Church to recall what belongs to the Church. He’s not encouraging people to join a movement, per se, but to open themselves to the Holy Spirit. Ralph noted that even the apostles, who had the best teaching from Jesus, didn’t really get it until they received the gift of the Holy Spirit. Fr. Matt said the Holy Spirit makes a difference for the preacher, teacher, and the one who’s open to the Lord. Scot said Ralph’s last book The Fulfillment of All Desire: A Guidebook for the Journey to God Based on the Wisdom of the Saints was a guidebook for people on a spiritual journey. Ralph said 7 of the 33 doctors of the Church had major insights into how we make the spiritual journey and he put all their best insights together. He said people don’t want to just have an emotional experience, but a steady enduring relationship with God. Scot said there’s a study guide for the book so a groups in parishes can go through the book together. Ralph said there’s also a video based on the book from EWTN as well. Ralph has another book coming out in September that deals with the confusion that can impede the new evangelization. He wrote it while in Rome finishing up doctorate last year. Fr. Matt said he read Ralph’s book and it’s a wonderful book with words of wisdom from great saints.